Daily Quests are important sources to make Blade and Soul gold in Blade & Soul. In general, you can get a total of 20-30 Blade and Soul gold by completing multiple sets of daily Quests. It usually takes more than 3 hours to completing all daily quests in game. This guide is to teach players how to complete Misty Woods World PvP which supply rich rewards. The rewards of Misty Woods World PvP are 60-80 Silver, 10-20 Soul stones and Faction Contribution Points. Look at the map of the daily quests, then teleport to the Cerulean War Tent Windstride point in the Misty woods. Remember to equip a Cerulean order uniform. Blackwyrm and the Player Kill quests will ask you to find a party. 1.There are seven quests in total, respectively are Unlawful Assemblage, Drawing a Line, Crimson Rage, Wyrm Turner, Soulstone Provider, No Right for Villains and Supplies and Demand. 2.To do these quests, you need a faction rank of Private or higher. If you don’t get this on your way of leveling, you can equip your Cerulean Order uniform and find the locations marked in the world map. Do it until you reach Private rank. As it only shows up when you put on the uniform, wear it! 3.Misty Woods is a World PvP zone. Watch out as there are many enemy players coming from other faction when doing these dailies. You should change channels if you get camped. 4.When finished, it will offer you 2 Soulstones or 1 soulston pounch as reward, it is suggested you pick the soulstone pouch. However, for the quest that rewards 1 soulstone pouch or 4 soulstones, just pick the 4 soulstones as the soulstone pouches include anywhere from 1-3 soulstones. 5.There is a quest requiring you kill the world boss Blackwyrm who is located on the plateau right above the quest are. If you are on a popular server like Poharan or Mushin, there probably are parties fight him. It takes lots of time to kill Blackwyrm. To kill Blackwyrm, you need to do a minimum of 913k damage to get loot form him. Doing 1% of his max HP will net you a basic box, but doing around 3% or more will net you the better box. 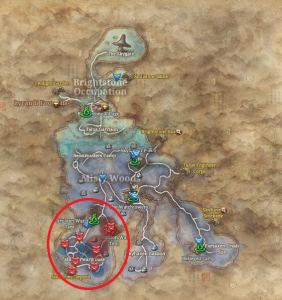 If your weapon isn’t Awakened Siren or better, this may be difficult especially because of how laggy it is trying to render 50+ players all zerging the boss. Blackwyrm has an AoE roar attack that will do around 25k damage. He uses this constantly. Have at least this much health so you don’t die immediately. As you can respawn after get killed, it is need to worry. Your dealt damage will carry over. It is kindly noted you that don’t release if you die when the boss is going to die. If Blackwyrm dies while you are running back, your loot will despawn by the time you make it back. Wait for a rez. Also, you will be asked to kill 10 high-ranking players in World PvP in the Misty Woods, which is quite difficult to finish. Some easy quests are killing NPCs or gathering within the area. All in all, it takes about 1 hour to complete including Blackwyrm + Player kills.